Pharmacist shares family recipes at Main Avenue @Pho.com restaurant in Gresham. Jasmine Nguyen wouldn't necessarily call running a pharmacy and a restaurant while having a baby a winning model for business success. And yet, with some course changes — and a little rest — she and her husband Pham Khong are making their multifaceted life work. 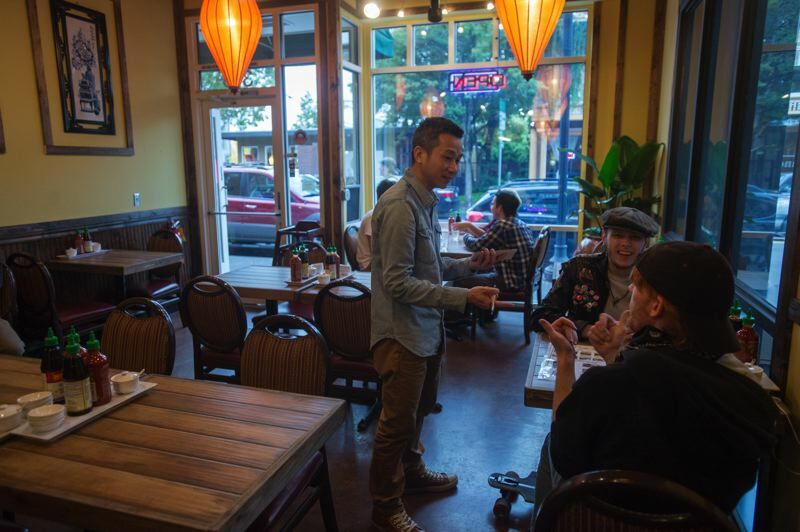 After closing their first location of @Pho.com Authentic Vietnamese Restaurant in east Portland two years ago, the couple reopened the eatery in downtown Gresham at 316 N. Main Ave., in September. The fully remodeled space is the former location of A Cajun Life, which closed in the spring. As Nguyen, a full-time pharmacist who operates Pharmacy.com at 7901 S.E. Powell Blvd., explains, something had to give when she had her son, Leo. "The pharmacy needed more room," she said. "I was pregnant and got the baby out three weeks early .... There was too much going on during that time. I decided to give up the restaurant and balance out between the baby and the pharmacy." With Leo now 2-and-a-half-years-old, the Happy Valley couple has a little more time to branch out. They went back into the food world more or less by popular demand. "My husband wanted to do something, and we talked about a coffee shop," Nguyen said. "A lot of my old customers were asking about (pho.com), so it turned out that we opened a new restaurant." "I used to manage the operation of the restaurant," she added. "My husband is doing more now." The small but charmingly appointed restaurant is named for its specialty, "Pho," a traditional Vietnamese noodle soup typically served with beef, chicken, or seafood with fresh rice in broth. Bean sprouts, basil, jalapeños in hoisin and hot chili sauce complement the dish. Entrees, which include a vegan option, are $13 to $15, with appetizers such as spring rolls, pot stickers, chicken wings and salad rolls available for $8. Recipes come from Nguyen's Vietnamese mother and grandmother. "My grandma had a restaurant too, so I had that from my family," she said. "The more we get into it, I guess, we improve our stuff." 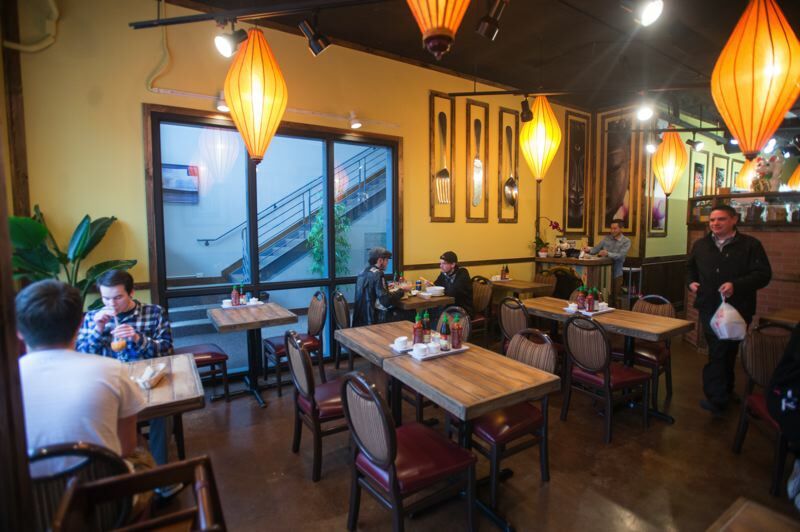 So far, most customers in Gresham, many of whom got hooked on Pho . com at the previous location, have a general familiarity with the pho concept. However, she and her and Khong's servers are happy to help initiate. "They kind of know what pho is," she said of newer customers, "but we kind of explain it to them. We explain what we have in (the bowl), the noodles and meat, and show them how to eat. "If you eat the right way, it tastes good," she added. "If you eat it the wrong way, it does not taste good." 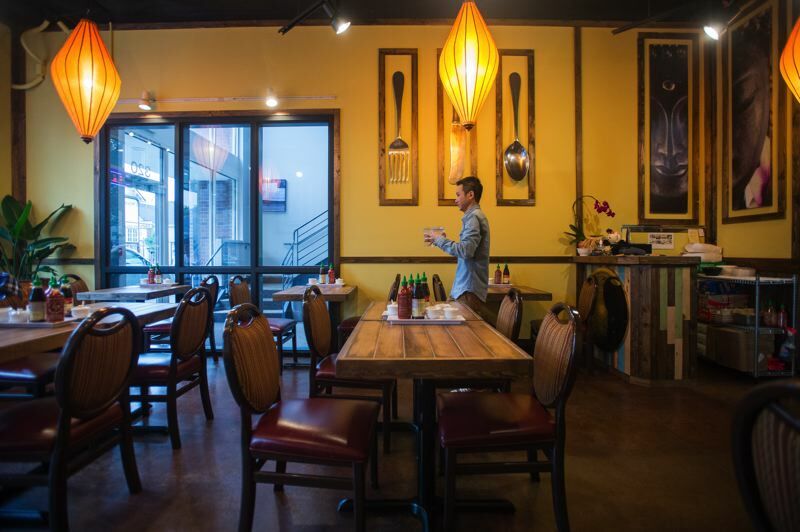 Nguyen and Khong, who started scouting for locations in April before settling on downtown's main drag, are pleased with where their new venture ended up. 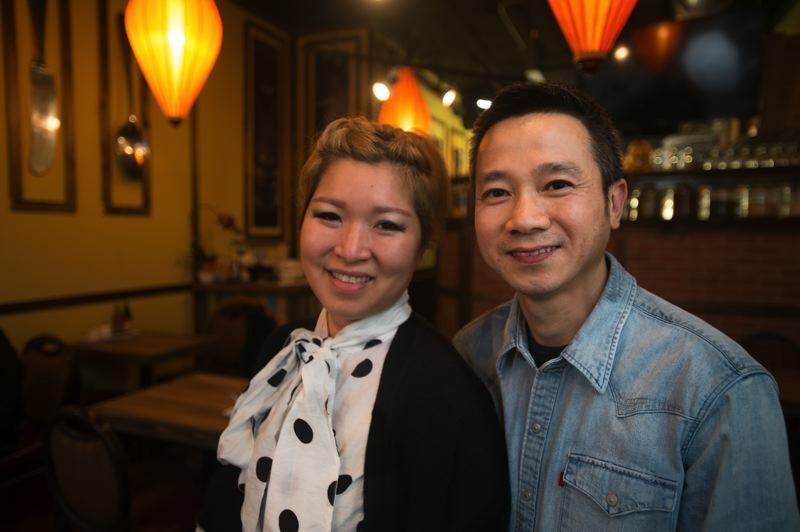 The former Cajun Life restaurant owners originally tried to sell the couple on their Beaverton location, but Nguyen and Khong felt it was too far from their family and business interests. "We went to check it out, but it was too far away," she said. "I like this area more, its closer to home." Pho . com has applied for a license to serve beer and wine. Nguyen makes a point of applying the customer-service skills she's acquired over the years in pharmacy and restaurant work to her newest food-oriented venture. "Our slogan is 'Fresh and healthy.' I don't like to walk into a dirty restaurant. We keep it nice and clean, so people walk in and feel better."